I have always hated “fruit on the bottom” yogurt. Although lately I’ve found it easier to ignore the noxious fact that it’s yogurt and actually eat it, I have always found that it’s near impossible to stir hard enough or long enough to properly blend the stuff. Either you end up with yogurt all over your desk / table / tie, or you end up with NASTY white streaks all throughout the goop. 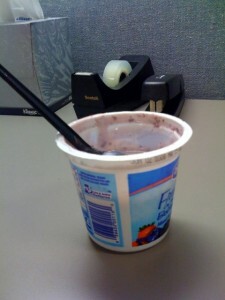 Sometimes you even have places where the yogurt was a bit more solid than the rest…and you get little chunks! Not the way I want to start my day. Tie in the fact that I visited the doctor yesterday and he basically ruled out anything good-to-eat in the mornings (eggs, bacon, sausage, etc. ), and you have a miserable Daddy Bear.